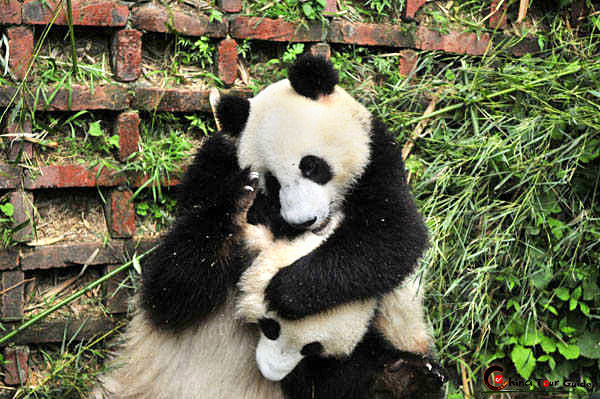 As one of the oldest and most interesting opera forms in Southwestern China, Sichuan Opera is a perfect blend of local dialect along with the customs, folk music, and dances from other regions. 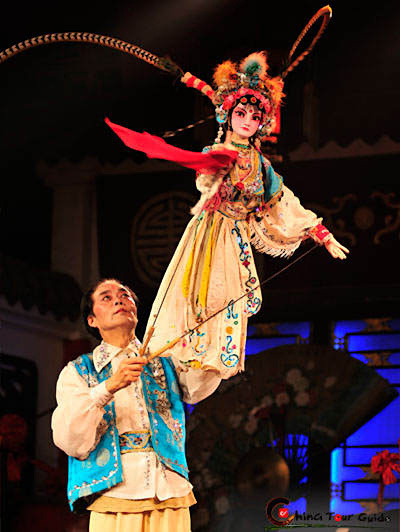 Sichuan Puppet Drama is a kind of stick-supported puppet controlled by strings, which often show at the beginning of the Sichuan Opera. Although the puppets are big and tall, and the puppets can also express all moods on the face as well as acting like smoking, changing dress, drinking, lighting up or blowing out a candle, waiving sleeves, playing instruments or sword etc to give you a new concept of puppet show. 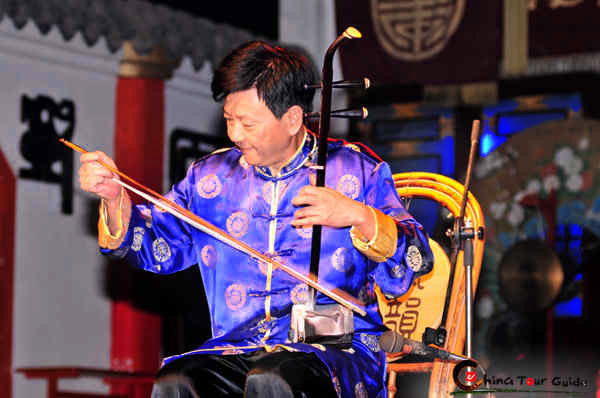 An old man is playing traditional Chinese music instrument - Erhu. Four actors at the beginning of the show. An actor is controlling the large puppet. An actor is performing the drama. 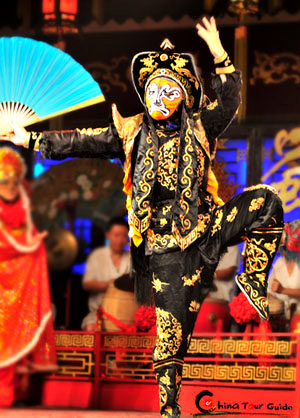 Sichuan Opera is known for three distinct features, Changing Faces, Spitting Fire, and Rolling Light. 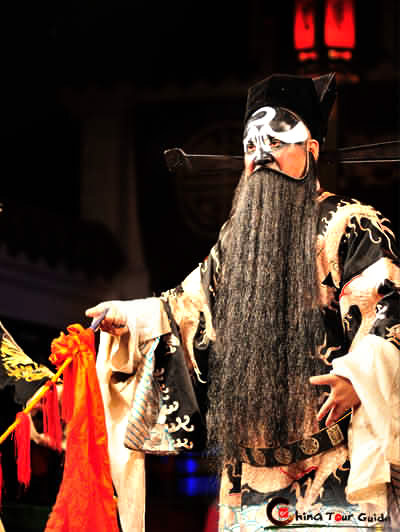 Changing Faces is a unique skill of Sichuan Opera, appearing almost magical to enthralled audiences. During the performance, the performers switch masks lightning fast to portray different characteristics and personalities of the characters. 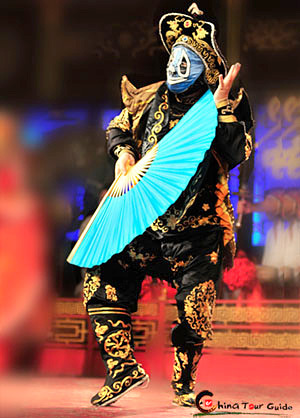 Changing face is the essential part of Sichuan Opera An actor is performing the "Changing Face" . 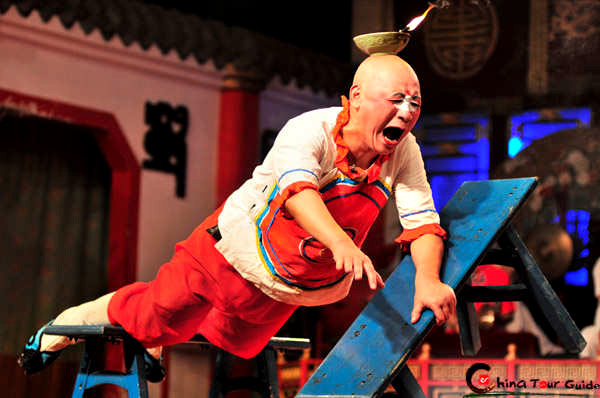 Spitting Fire is yet another distinctive of Sichuan Opera. 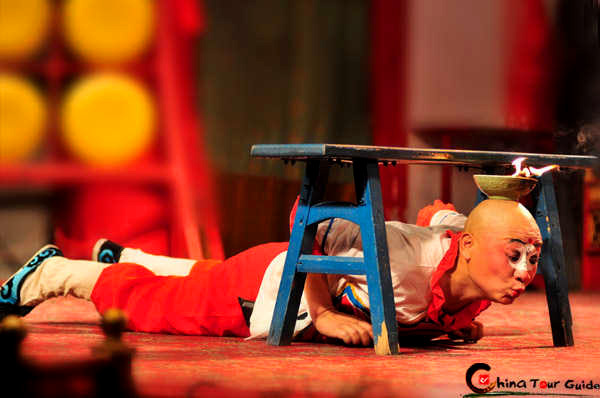 It is performed flawlessly in the Legend of White Snake, a key story that is a cornerstone of Sichuan Opera. The skill is hard to master, but when perfected is both entertaining and astonishing. 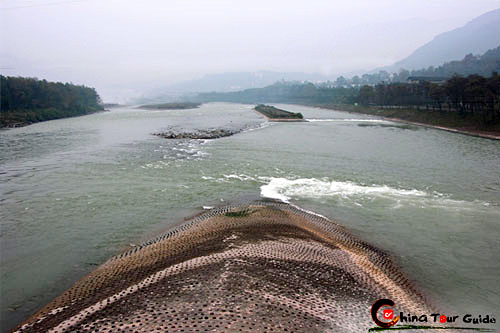 The best place to see Sichuan Opera is Shufengyayun Operatic Circle, which is located in Chengdu Culture Park on Qingtai Road. 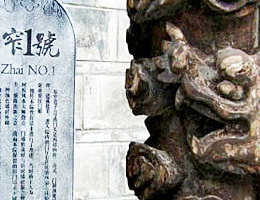 This stage is inside Green-Ram Abbey, the famous Taoist temple. In keeping with the Old West Shu style, the building is of primitive simplicity. 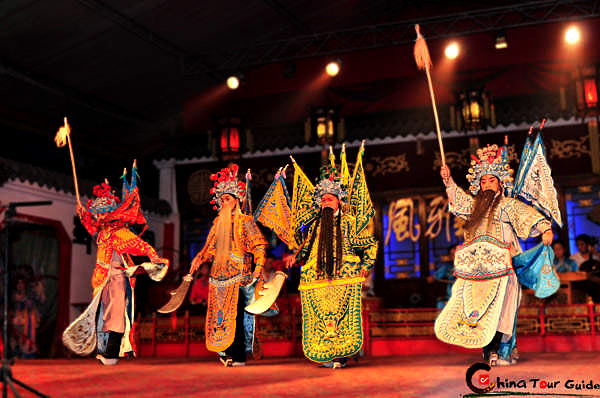 The hall has functioned for over a hundred years and now attracts distinguished performers from across Sichuan Province who hold China Sichuan Opera performances each evening. This daily show continues to spread the traditional art to a new generation and keep the historic culture alive. 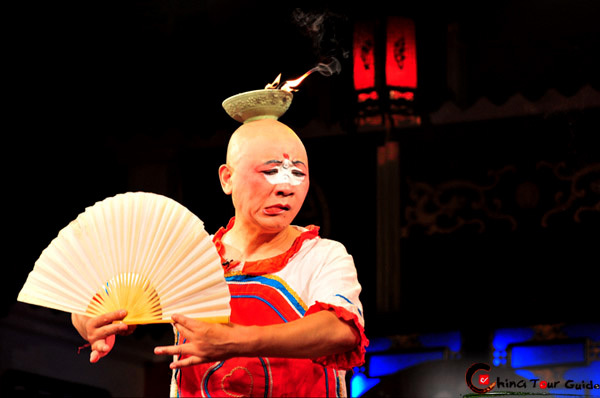 The actor holds a burning candler over his head with a fan. The actor is performing the Rolling Light under a bench. The actor is performing the Rolling Light on a bench. 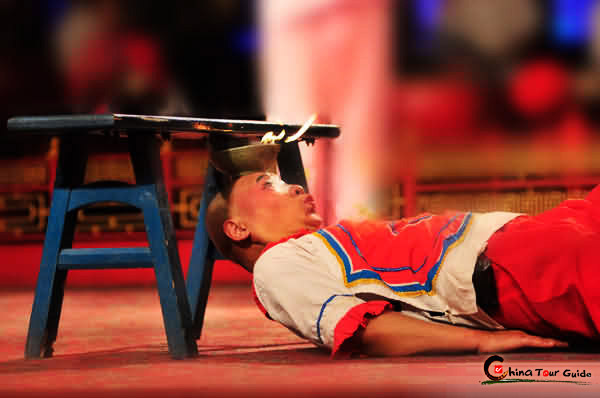 The actor holds a burning candler over his head to get through the bench.